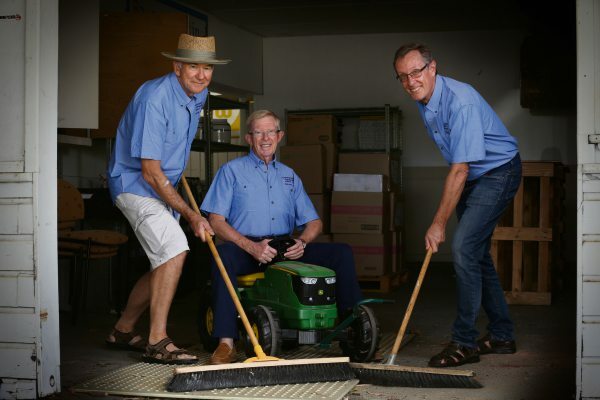 CLAREMONT Showground will have Australia’s newest Men’s Shed when inaugural members complete a $475,000 refurbishment of the site’s former Farm Animal Kingdom Pavilion in the next eight weeks. “As it happened, Royal Agricultural Society president Paul Carter already had his own goal of putting a men’s shed in the showground,” community men’s shed chairman Trevor Gorey said. The new shed and the RAS signed a peppercorn, 20-year lease on Monday. Mr Gorey said they had not found the right site, including “difficult” tries to use the former Sunset Hospital site in Dalkeith, until the RAS’s offer. He said their shed would primarily aim to improve men’s mental health by offering a place to enjoy mateship and avoid social isolation. Members will initially do woodwork but plan other activities including horticulture, cooking, fixing items for the public and doing odd jobs from May. Funding for the refurbishment depends mostly on grant applications being considered by Lotterywest, the Peron Foundation and the Gaming Community Trust. Shed patron Michael Cheney has already contributed $50,000 and there are 140 expressions of interest for memberships.